Domaine Leplan Vermeersch has been around since 2000. However I only recently discovered the quality of wines coming from this estate. Domaine Leplan Vermeersch is owned by the famous race car driver, Dirk Vermeersch who was forced to leave the racing world after a serious auto racing accident. Dirk Vermeersch made his first wines from vines located close to Tulette with the 2001 vintage. Most of the Southern Rhone Valley vineyard land owned by the Vermeersch family is in the Cotes du Rhone appellation. There they have 24 hectares of vines. They produce both red and white Cotes du Rhone. They also own 2 hectares of vines classified as IGP. Not only do they produce wine, but they also make LePlan Belgica Gin. In 2006, Dirk Vermeersch purchased .6 hectares of vines in Chateauneuf du Pape. Leplan Vermeersch is a family owned vineyard. Ann Vermeersch, the daughter of Dirk Vermeersch has been working with the estate since 2005. She will eventually take over the property. Domaine Leplan Vermeersch is one of the smallest land holders in the entire Chateauneuf du Pape appellation as they own a small .6 hectare parcel of vines in the region. 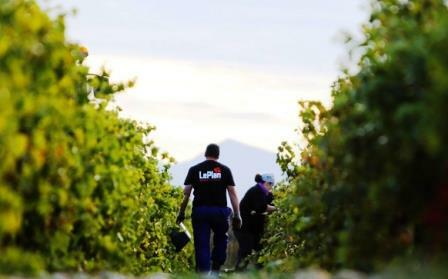 All the vineyard work that takes place for Domaine Leplan Vermeersch is 100% organic. Select parcels have been certified as organic by Ecocert. In time, it is expected that all of their vineyards will be 100% organic and certified. Domaine Leplan Vermeersch, as you might expect with holdings of only.6 hectares of vines, they only produce 1 red, Chateauneuf du Pape wine from 100% old vine Grenache vines. Domaine Leplan Vermeersch GT-1 Chateauneuf du Papeis aged in Demi-muid for an average of 12 months. As you should expect, the production is quite small. About 200 cases are produced of this wine in every vintage. The wine with its name of GT-1 is named after a racing term. The black and white checkered pattern on the bottom of the label is also a racing symbol of a flag that is only displayed to the winner of the race. Domaine Leplan Vermeersch can be enjoyed on the young side. Young vintages can be popped and poured, or decanted for about 1 hour, more or less or take. This allows the wine to soften and open its perfume. Older vintages might need very little decanting, just enough to remove the sediment. Domaine Leplan Vermeersch is usually better with 3-5 years of bottle age. Of course that can vary slightly, depending on the vintage. In the best vintages the wine should be consumed within 4-14 years after the vintage. Domaine Leplan Vermeersch is best served at 15.5 degrees Celsius, 60 degrees Fahrenheit. The cool, almost cellar temperature gives the wine more freshness and lift. Domaine Leplan Vermeersch is best served with all types of classic meat dishes, veal, pork, beef, lamb, duck, game, roast chicken, roasted, braised, stewed dishes, sausage, barbecue, grilled meats and cassoulet. Domaine Leplan Vermeersch is also good with Asian dishes, hearty fish courses like tuna, mushrooms, cheese pasta, eggplant and tomatoes. Stylish, with a very modern leaning, the wine is full bodied, polished, silky, round and loaded with smoky, ripe, dark, red spicy fruits, licorice and olive tapanade. If the oak manages to fully integrate, this will be even better. Forward, soft, lush, round, early drinking charmer, with sweet, ripe black raspberry, kirsch, licorice, smoke and espresso notes. You can already enjoy this wine today. Fleshy, polished and modern styled, this full bodied, intense, sexpot of a wine is rich and ripe and packed with layers of ripe, dark, red spicy fruits. Rich, lush, opulent and packed with sweet kirsch, black raspberries, cherries, thyme and peppery notes, this is ready to go. Made from 100% Grenache, the wine is ripe, slightly jammy, but there is more than enough freshness and purity of fruit to go around.